3:Laminate wood door configuration can be both single bedroom door or double bedroom door ,swing type or sliding bedroom door. 2:FORMICA/High pressure laminate door facing ,numerous wooden ,metallic ,solid color to choose from. 3:Excellent durability and resists moisture absorption .45mm flush door slab thickness ,with aluminum edge and aluminum honey comb and tube infilling ,making our door completely waterpoof and can withstand tough exposure for both exterior and interior . 4:high standard lock set and visible hinges and concealed hinges are all available. 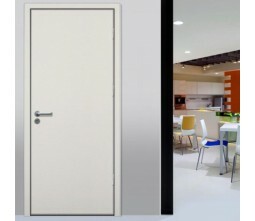 5:SAMEKOM High pressure laminate door can be 30m or 45m fire rating. 6:Shipping: We can offer to door service to cities in USA,CANADA,AUSTRALIA and most of the coutires in Europe ,and to Port service to major ports all around the world.